Strike an upscale tone with a chic wedding color palette. A delicate combination of pale blue and antique gold would be just the thing for a formal afternoon wedding. A little bit vintage, completely stylish, pale blue and gold is an exquisitely elegant wedding color scheme. A light blue and gold palette would be lovely for a ballroom wedding or one held in an historic mansion. Picture a room decorated with pale blue silk dupioni tablecloths with a quilted pattern. Delicate gold chiavari chairs will bring in the metallic accent. 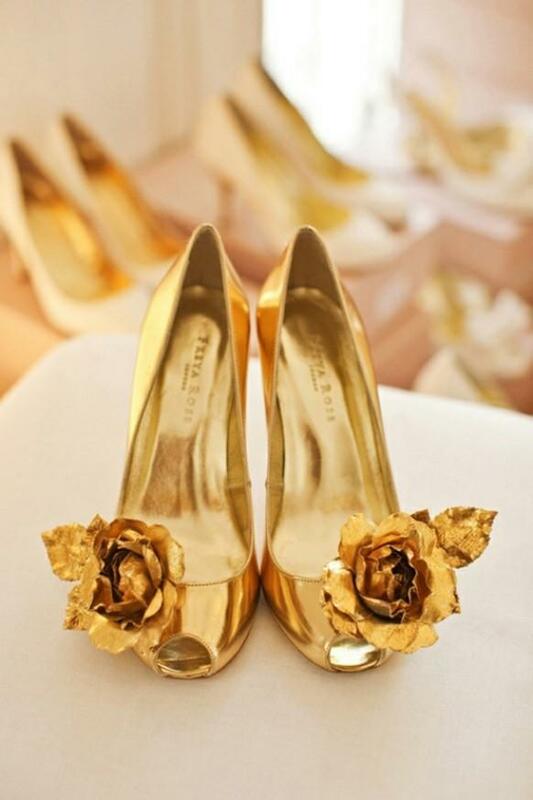 Opt for a soft burnished gold throughout, rather than a bright and shiny metallic. That will keep the look understated, and will bring out the vintage flavor of this beautiful color combination. Rich accents like gold tassels for napkin rings and candles in blue and gold jacquard patterned votive holders will be perfect. As for the attire, pale blue and gold are flattering and easy to find. Choose a soft blue for the bridesmaid dresses in a chic fabric like silk chiffon, silk satin, or silk shantung, depending on the season. Long slender dresses will suit the elegance of the color scheme. Bring in the golden accents with custom blue crystal bridesmaid jewelry handcrafted with thin gold links. The blue and gold bridesmaid jewelry sets will be quite special, and your attendants will enjoy them after the wedding as well. The bride can bring in hints of the signature colors in the form of luxe gold silk sandals or pale blue silk slingbacks (for the "something blue", of course). If you wish to up the luxury factor, select a bridal gown with fine gold lace or golden embroidery on the bodice. Blue is a somewhat limited color when it comes to flower options for the bouquets and centerpieces. However, there are some lovely ways to incorporate hints of your special colors into the wedding floral arrangements. 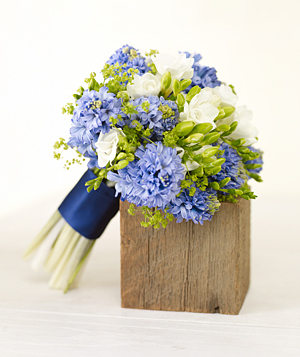 Summer brides can use blue hydrangeas tied with wide gold ribbons for the bridesmaid bouquets. Or create soft bouquets using romantic ivory flowers such as sweet peas, peonies, and garden roses. Blue or gold sheer organza ribbons will bring in the color accents. For a very rich look, try adding burnished gold stamped metal leaves to fresh flower bouquets. The centerpieces will naturally be displayed in golden vases, which will tie in beautifully with the pale blue tablecloths and gold chiavari chairs at the reception. The wedding cake is a natural place to highlight your wedding colors. 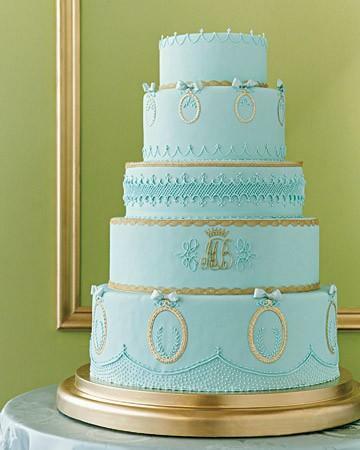 Design a pale blue cake with an elegant golden design. Possible motifs include baroque or scroll patterns, acanthus leaves, or gold monograms. Cakes with round tiers are always nice of course, but you may also wish to consider confections with a more unique form, such as square or octagonal layers. An antique crown would be a magnificent topper for such an exquisite wedding cake. Without a doubt, pale blue and gold is one of the most stylish wedding color combinations a bride could choose. It is rather grand and formal, yet it also tasteful and understated. Blue and gold may just be one of the very best color palettes for an elegant wedding.